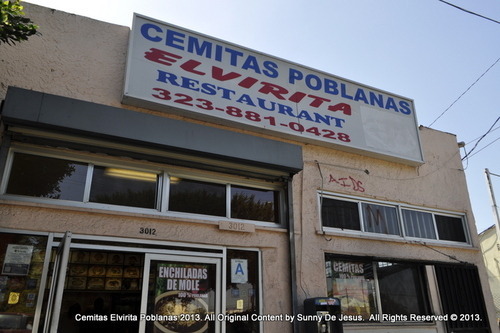 When I’m not in the mood to eat at fancy restaurant or grub on a burger at a hipster restaurant, I take a slightly longer drive past downtown Los Angeles to the city of Boyle Heights to eat at one of my favorite hole in the wall restaurants there called Cemitas Poblanas Elvirita. Cemitas Poblanas Elvirita is a tiny restaurant with just the very basics; tables, chairs, a jukebox that plays Mexican music, a TV set to soccer games, and two old men in cowboy hats plastered at their favorite table who appear to be recovering from last night’s hangover. Who could blame the two old men for eating at Cemitas Poblanas Elvirita? I, for one thing, see why they return to this restaurant to dine. It’s all about how good the food tastes here. I’ve heard of this establishment a few years ago right around the time Food Critic Jonathan Gold tipped off his readers when he was still writing for LA Weekly. Since reading his first critique of Cemitas Poblanas Elvirita, I’ve been hooked on eating there since. 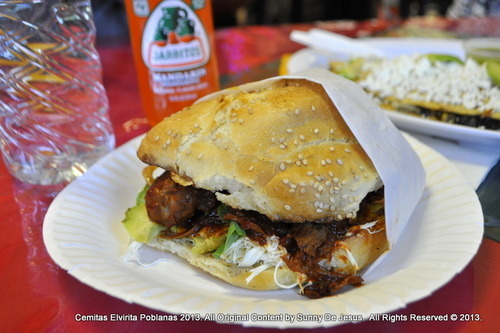 Cemitas Poblanas Elvirita Restaurant really does make the best Mexican cemitas poblana, which are sandwiches made from a distinct bread roll with origins from Puebla, Mexico. Oh boy, does this bread tastes so good. It tastes a lot like toasted sesame seeds, and it’s texture is light and crisp. My favorite Cemita Poblana is the #14 Cemita de Pierna, which is a sandwich made of pork shoulder stewed in a chipotle adobo sauce and topped with some salty cheese and a few slices of avocado. I never get tired of eating this sandwich. 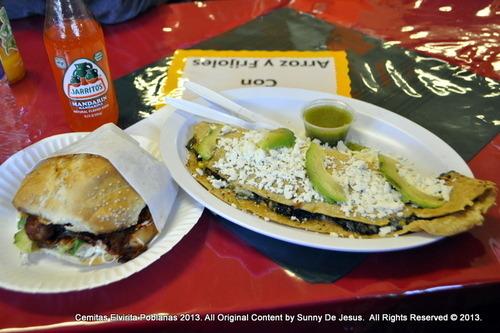 My other favorite food item to eat at Cemitas Poblanas Elvirita is their Huilacoche Quesadilla. Huilacoche in Mexico is what truffles are to the French. Huilacoche is a corn fungus. You might think that it’s this gross thing to eat, because of its black color. Well, don’t be fooled by looks alone; the taste is suitable for a gourmand palate even those from the French. To me, Huilacoche tastes like best creamed corn that you’ve ever tasted. Prepared as a quesadilla with lots of melted cheese and stuffed between a thick tortilla, the Huilacoche Quesadilla is transformed into a simple, delicious meal. 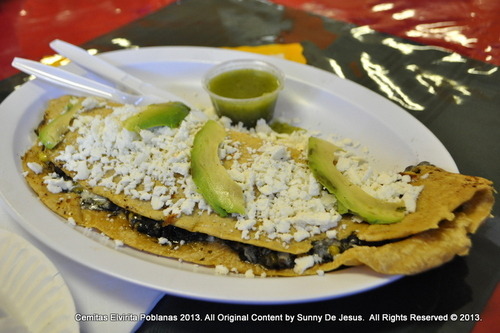 Like any mom and pop, hole in the wall restaurant, Cemitas Poblanas Elvirita has slow service. It’s one of those places where they call family members and close friends to help when there is a long line. So expect a little confusion with the orders and some down time in between your orders as well. It’s also the kind of place that’s cash only. Sometimes, just sometimes, they take credit cards when one of their servers remembers how to use the credit card machine. I think you’re safe bringing about $40 cash. I’ve, on average, spent $17 for my meal (cemita, quesadilla, and a couple sodas). One last note, I’m not too keen with being in the area at night, so I highly recommend that you come to eat lunch instead. Next I love Fluff Ice, I heart Fluff Ice…like yeah!